There’s no denying how digital life has changed the way we live (and behave) today. Pew Research Center and Elon University’s Imagining the Internet Center recently canvassed storiesfrom technology experts and scholars about the current and future impact of the Internet. Experts were concerned about the way people’s online activities can undermine truth, foment distrust, jeopardize individuals’ well-being when it comes to physical and emotional health, enable trolls to weaken democracy and community, kill privacy, and open up larger social divisions as digital divides widen and more. These same experts and scholars are quick to remind us of the many positive sides that technology has brought us. With all this power at our finger-tips, we have slowly witnessed the corrosion of both online and offline civility among humanity. Using public shaming to shift our beliefs rather than having constructive conversations has become the new normal. Are we now blurring the lines between activism and [cyber]bullying or humiliation? Many people remember the public shaming of Justine Sacco or maybe Lindsey Stone that went viral and cost both women years of online reputational damage. People from all walks of life participated in vilifying these women—the majority never meet them or knew them, however with the click of a keypad, were able to ruin their lives. We shame to pressure outliers to conform to our norms—even if no one can agree anymore what those standards should be. In other words, being the victim of a public shaming has the potential to ruin your life—financially, emotionally, and physically. In the most extreme cases of online harassment, we have seen the worst-case repercussions over and over again: young people taking their own lives and adults losing their livelihoods. In a culture of rising incivility, combined with many that are both sensitive and passionate about their beliefs, people are using bullying or harassing behavior and labeling it as activism. The latest target to experience this is Tess Thompson Talley. Although she’s an avid hunter, which many animal rights activists as well as animal lovers may not agree with, it doesn’t dismiss her right to her interests and hobbies as long as there is nothing illegal. Hunting is definitely not for everyone (myself included), however to blatantly mock her and send her death threats on social forums is not activism — this is a form of harassment. In an age of online hate, it’s disheartening to watch adults criticize and send digital daggers at each other. These are the same people that are supposed to be the role models for the next generation. Talley is not alone. In the past couple of months she’s had company. BBQ Becky, Permit Patty and Pool Patrol Paula are all nicknames for average people that made public spectacles of themselves forgetting there is always someone ready to aim and shame your most embarrassing moments. When activism turns into digital or civil warfare, the message will likely get lost and all people will remember is static noise. Change can’t and won’t happen through this type of behavior. You may not have heard of the restaurant in Virginia, Red Hen until it made headlines after White House Secretary Sarah Huckabee Sanders was asked to leave by the owner because they didn’t agree with her politics. It didn’t take long for social feeds to light up and publicly shame both Sanders and Red Hen, especially since there was another restaurant in Connecticut with the same name struggling to let people know it wasn’t them. 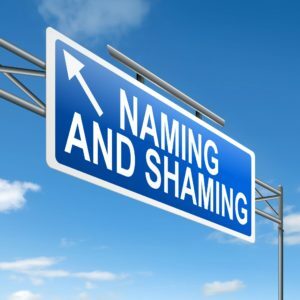 In his recent article, The Ricochet Effect of Public Shaming Now on Full Display, Mitch Albom helps explain how divided people are today and how it contributes to public humiliation. To use words like “honesty, compassion and cooperation” as reasons to evict someone shows a total lack of, well, honesty, compassion and cooperation. As for “compassion,” what compassion are you showing for someone who, for all you know, may struggle with certain elements of her job herself? Nor is this about “cooperation.” It’s the opposite of cooperation. It’s about your feelings trumping everything else, include decorum, manners or common decency. Sanders didn’t murder anyone. Albom ends his essay by reminding us, it’s about us! As we watch people in authority behave inappropriately as well as adults, business owners and others, it’s up to us to lead by example. Being an activist is admirable. You don’t have to be a bully—be constructive with your behavior (comments), not combative. There is never a reason to use profanity, mock people or especially wish death to others. One lasting thought, you are your online presence. Your immediate gratification to insult someone for what you may believe is activism, will be attached to your digital resume forever. Short-term vindication is rarely worth the long-term ramifications. Having a bad day? Give yourself permission to sign-off.